Climate-smart agriculture (CSA) is agriculture that has been transformed and reoriented to support development and ensure food security in the face of climate change. CSA aims to tackle three main objectives: sustainably increasing agricultural productivity and farmers’ incomes, adapting and building resilience to climate change, and reducing and/or removing greenhouse gas emissions . The CSA approach can help to identify and address synergies and trade-offs involved in pursuing the three objectives by addressing the environmental, social, and economic dimensions of sustainable development across agricultural landscapes. The approach helps to align the needs and priorities of different stakeholders to achieve more resilient, equitable, and sustainable food systems. In Belize, CSA is understood to be agriculture that sustainably increases productivity and incomes, improves the ability of producers to adapt to climate change and build community resilience, and enhances food and nutrition security, while achieving mitigation co-benefits in line with national development priorities. While the CSA concept is still evolving, many of the practices and technologies that make up CSA already exist worldwide and are being used successfully . Mainstreaming CSA in Belize will require systematic identification of locally effective CSA practices, diagnosis of barriers to adoption of those practices, evaluation of strategies to overcome the barriers, and ensuring the presence of institutional and financial enablers. This CSA Country Profile describes the risks posed by climate change to agriculture in Belize, discusses the potential of CSA to mitigate those risks, identifies factors that can influence adoption of CSA practices, and points to potential entry points for investing in CSA at scale. CIAT, World Bank. 2018. 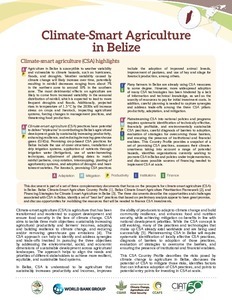 Climate-Smart Agriculture in Belize. CSA Country Profiles for Latin America and the Caribbean Series. International Center for Tropical Agriculture (CIAT); World Bank, Washington, D.C.